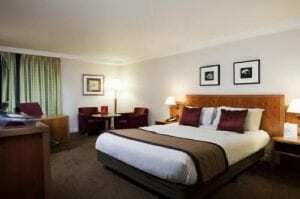 The Crowne Plaza London Heathrow Airport sits in an enviable location, far enough from the airport to avoid the fight paths and plane noise but close enough to have you into the terminals within minutes. 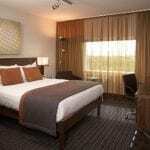 Located just of the M4 the Crowne Plaza has plenty of on site car parking both at the front and rear of the hotel. The entrance lobby houses reception and also the restaurants, pub and cocktail bar. Sit down for a sumptuous dinner in Orwell’s Brasserie or a pub classic in Dr. O’Driscolls Irish Bar. 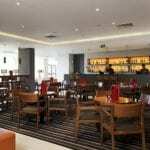 The buffet style breakfast is served in Orwell’s Brasserie with continental or full English available, or maybe just ask the chef to make fresh the omelet of your choice. 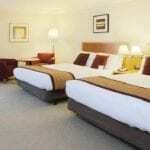 The en-suite rooms are well appointed with a choice of standard, family or executive, all feature luxury mattress toppers, plush duvets and soft pillows, along with blackout curtains. 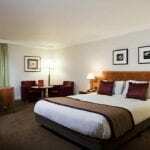 The rooms have tea and coffee facilities, HD TV’s a desk and minibar. If time allows then relax and enjoy the Spirit Health Club with fully equipped cardio vascular rooms and large swimming pool. Exercise on running, cycling or rowing machines and then perhaps a dip in the sauna or steam room. The large pool has plenty of space to swim, or relax on a lounger beside with a refreshing drink. Hoppa bus tickets for transfers to the airport can be purchased at reception, or the concierge can arrange a taxi or other transport. 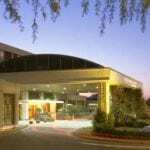 The Hoppa bus route takes in a number of hotels but in general the Crowne Plaza is near the end of its route meaning your journey into the airport is very short.